There are many reasons to adopt a pet. Whatever yours may be, an inevitable outcome is companionship. 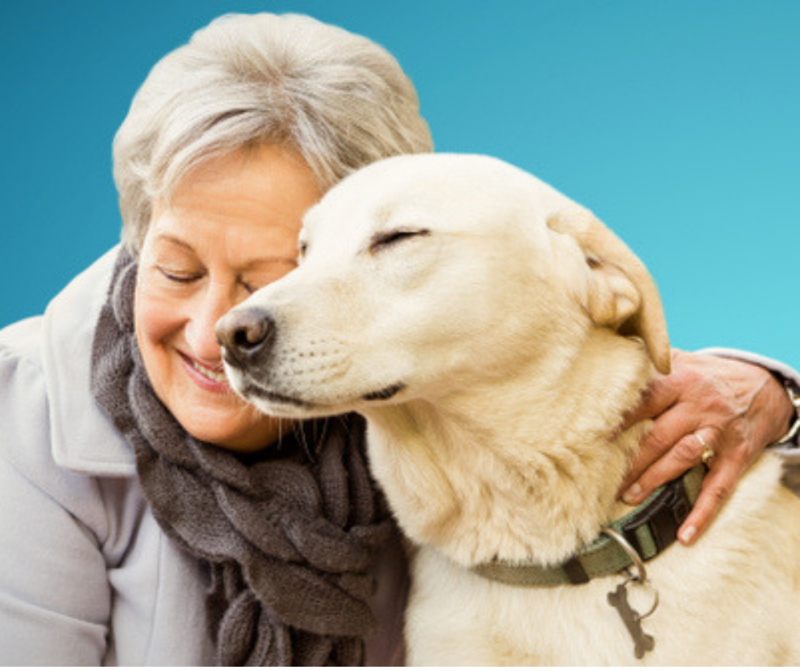 95% of pet owners consider their animal a member of the family and with that comes a wide variety of mental, physical, and emotional benefits for both the dog and owner, especially if they’re senior citizens. As many senior citizens often have empty nests, a new dog – whether young or old – can help occupy a once-busy schedule. Seniors will be able to fill their time researching breeds, shelters, and breeders and talking with friends and family about their different dog experiences; opening up this dialogue can also foster new relationships and open up new doors. Right from the very start, elderly owners become invested in their new family member. Similarly, once welcomed into the home, a dog will surely keep their owner occupied. Because dogs have their own routine, being a pet owner keeps their owners on their toes. Puppies especially have to go out every few hours, eat on time, and require a lot of supervision, as they usually get into mischief (we’re sure many puppy owners can attest to this). Therefore, owners spend a lot of time with their dogs, retired owners especially. The more time spent together, the stronger the bond with man’s best friend becomes. This relationship between pet and owner, though, goes beyond long walks and belly rubs; there are many secondary health benefits of owning a dog that both owners and dogs can look forward to. For example, according to the American Heart Association, owning a pet can protect you from heart disease, as it’s no secret that by having an animal around a person’s serotonin level rises while reducing cortisol, a stress hormone. Dogs can also be of aid to those with dementia or Alzheimer’s. Even simply petting the dog or scratching a tummy can help work out pain and soreness in finger joints and arthritic hands. Similarly, dogs can help senior citizens stay active and mobile. As we age, being sedentary can have negative effects on a person’s health. Having a dog around will likely encourage owners to be more mobile and involved. Whether the new dog is active and energetic or lazy and laid-back, it’s important that they get lots of time outside. This means an elderly owner must regularly get up to let the dog outside or take them for a walk. As this routine develops, make sure to keep WINPRO Mobility on hand to ward off sore joints and aches. And as many elderly owners are retired, they have the time in their schedules to do so and can devote as much time to their furry friends as they’d like - a perk most pups will love. Owning a dog is a major change in lifestyle, for the elderly especially. More often than not, though, when someone becomes a dog owner, they don’t simply gain a pet, they gain a family member. Keep this new family member looking and feeling great with WINPRO. 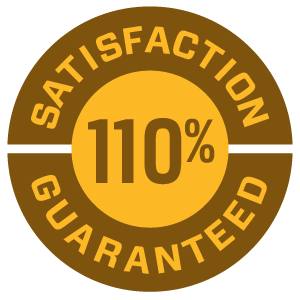 View our products page to learn more about our different pet supplements. 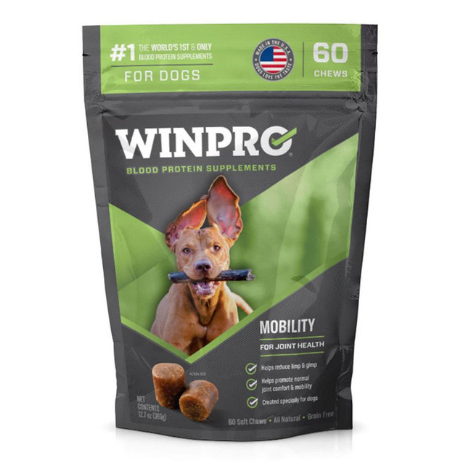 WINPRO MOBILITY contains a blend of animal blood proteins and other key ingredients to support canine joint function and help dogs maintain joint mobility so they avoid “limp & gimp”, especially during times of increased activity. This product promotes joint comfort and movability and helps reduce stiffness & soreness from exercise or natural aging. A great product covering your dog's entire life cycle.